It’s asparagus season; it’s also wild garlic season. Two of my favourite things, and they go together so well. And frittatas, they’re definitely a go-to weekend brunch staple. Easy to make, and very tasty, and you can fill them with pretty much anything. So what happens when you combine them all? 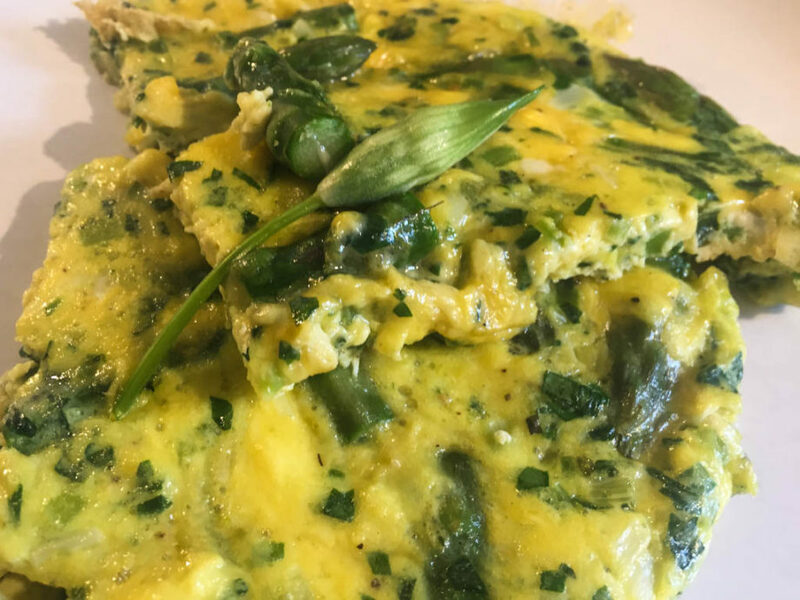 Wild garlic and asparagus frittata sounds delicious to me. 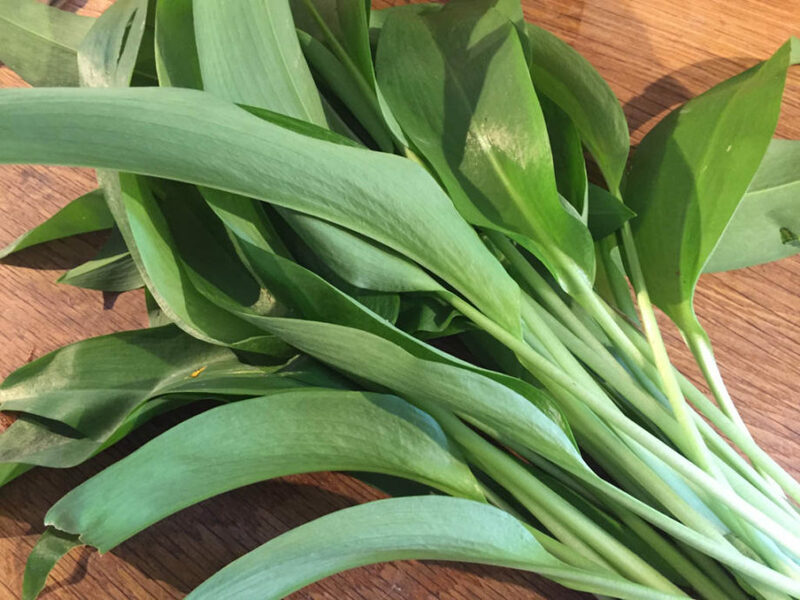 We have a tonne of wild garlic growing in the garden, so I went out and picked a bunch, and at this time of year, there’s pretty much always some asparagus in the house, so we’re all set. 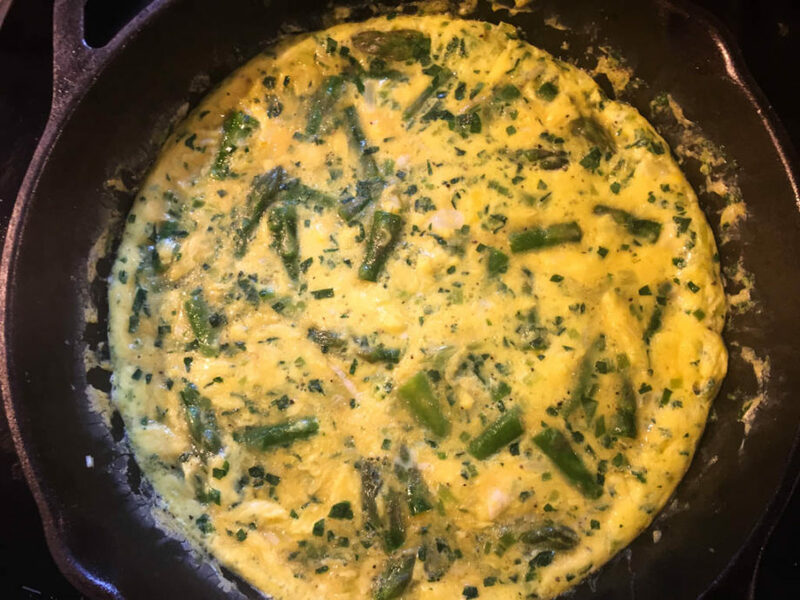 Wild Garlic and Asparagus Frittata, serves 2. Break the eggs into a bowl, add a generous pinch of salt and some black pepper, the beat until well mixed. Put the eggs to one side while you get everything else ready. Remove the thicker stalks and bulbs from the garlic and chop them finely. If you only have leaves, and don’t have stalks and bulbs, don’t worry about it – just skip this part. The leaves alone will give a good flavour. 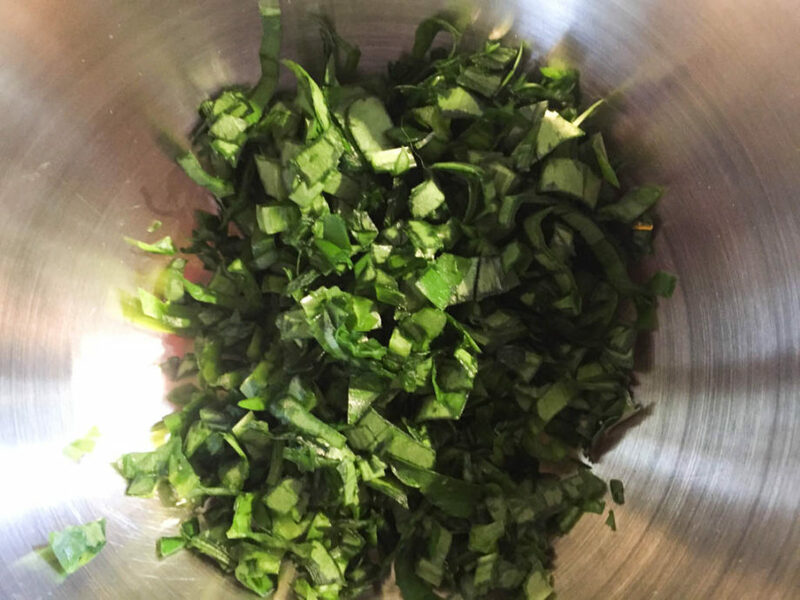 Thinly slice the garlic leaves. The easiest way to do this is to stack them lengthwise, and roll them up into a cigar shape and cut that into fine slices. Remove any woody ends from the asparagus, and chop the spears into 2 – 3 cm long pieces. 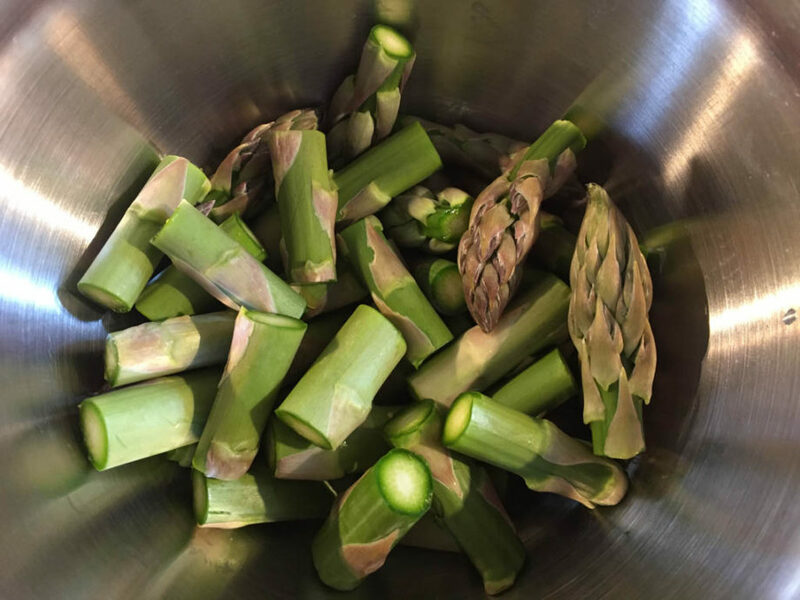 Blanch the asparagus: bring a large pan of water to a rolling boil, drop the asparagus in and simmer for two minutes. 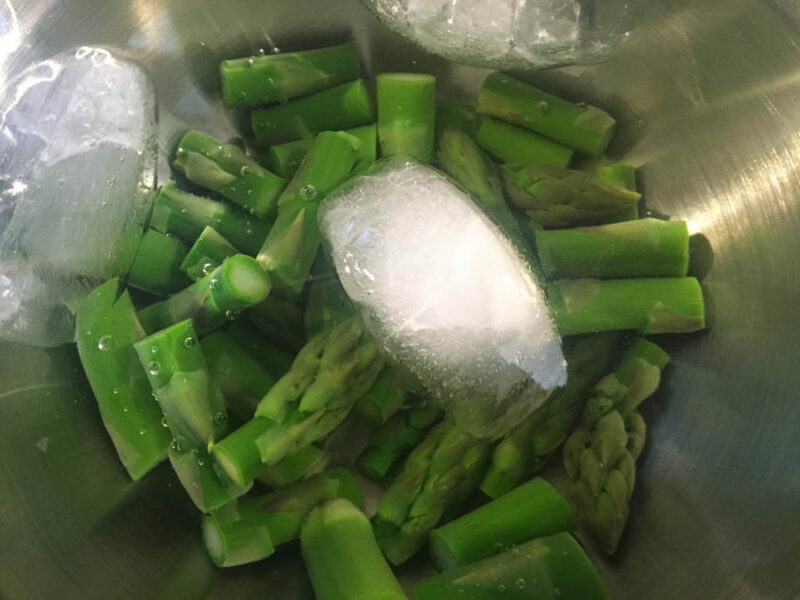 Drain the asparagus and plunge immediately into cold, iced water to stop it cooking further. Take a cast iron pan, or other frying pan that can be placed under the grill (or “broiler” if you’re over on the other side of the Atlantic), and heat up a few tablespoons of olive oil over a medium heat. While you’re at it, turn on the grill to heat up. 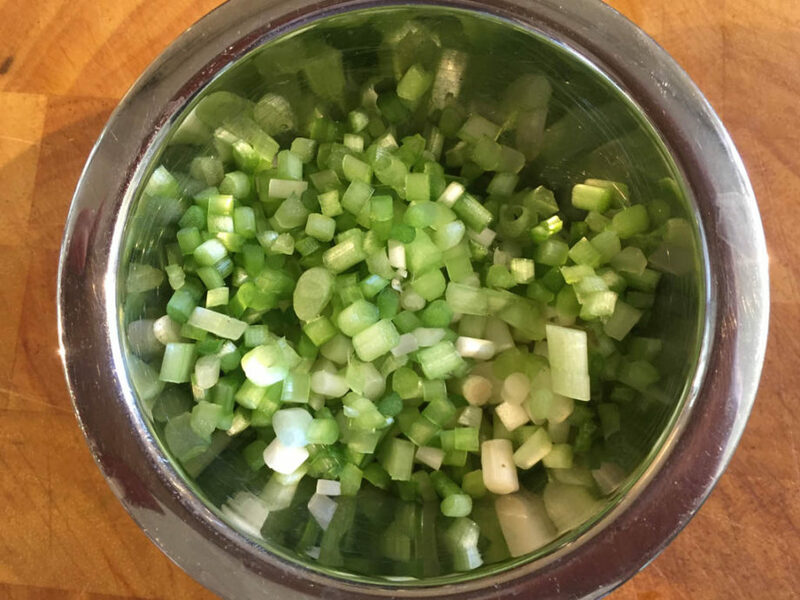 Gently fry the chopped bulbs and stalks for a few minutes until they start to soften. 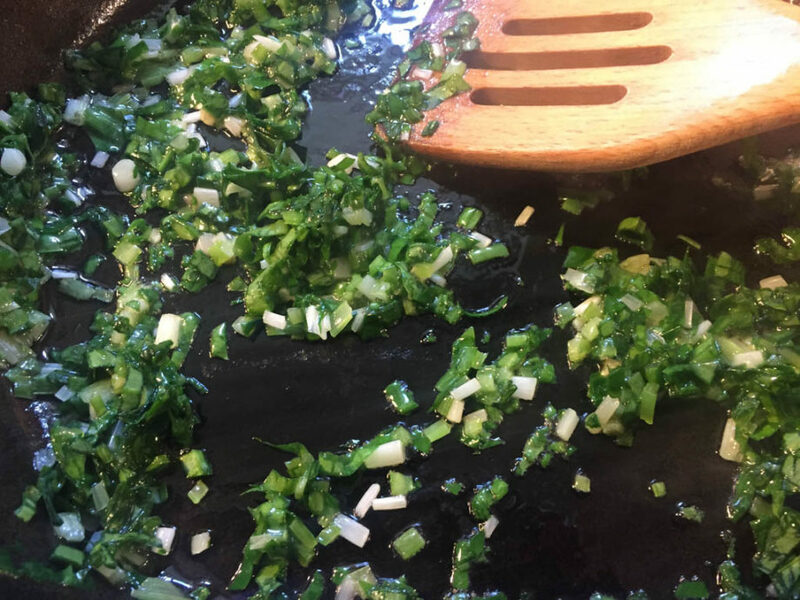 Add the garlic leaves and stir for another minute. Drain the blanched asparagus spears and add them to pan, stir-frying them for a minute or so until they warm through. Add a sprinkle of salt and some black pepper, and then pour in the eggs. Keep stirring the eggs for a minute or so while they start to cook. Stop stirring when there are a decent number of clump forming, but the egg is still very soft and liquid. Make sure the asparagus is evenly distributed around the pan – ideally you want a piece in every mouthful. 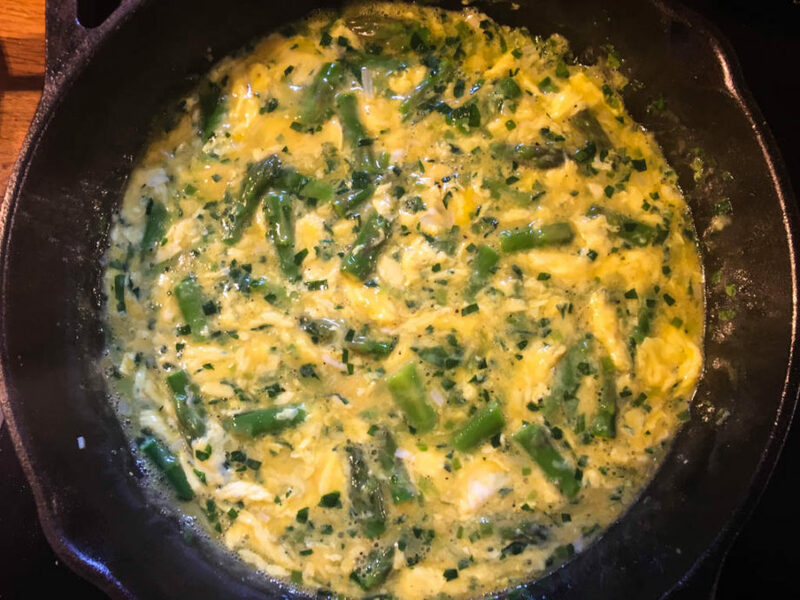 Once the frittata has cooked on the bottom and around the edges, it’s time to move the pan to under the grill to cook the top through. This should only take a minute or two – the top should be just set. Lift out of the pan (it will probably stick a little bit, don’t worry about that) and serve.